The general public’s understanding of seasonal produce is greatly reduced by the fact that you can buy pretty much anything all year round. This is largely thanks to imported fruit and vegetables that the supermarkets stock, often alongside products produced in the UK. This means that shoppers just pick up whatever products they want, rather than look at what items are produced locally and seasonally. More and more customers are realising that using seasonal produce is better in lots of ways. Better for your health, better for your wallet and better for the environment. Seasonal produce tastes better too! If you buy seasonal produce, it needs less seasoning or sauces as the natural flavour of the fruit and vegetables is better. Internationally grown fruit and vegetables have usually been flown to the UK and often kept in cold storage in centralised distribution centres. Invariably, seasonal produce contains more nutrients and vitamins as it has reached your table quicker than the same product flown half way across the world. In order for international produce to reach the supermarkets, it has to be chilled quickly in order to be transported. While this is not dangerous to the produce, it can mean that the natural process of ripening is halted. This is usually true and the only reason it isn’t always true is that supermarkets can bamboozle customers with ‘two for one deals’ and suchlike that are not a fair representation of the cost of the product. A great way to appreciate the realistic cost of seasonal produce is to go to your local farm shop, greengrocers or food market. Many towns have a weekly market, with larger towns and cities usually having some sort of static market. Once you step away from the supermarkets, you can see what is in season and how much tastier and cheaper it is. Supermarkets have become too used to resorting to bullying tactics with their local suppliers, which can make produce flown thousands of miles seen cheaper. Once you have made friends with your local fruit and vegetable supplier, you can ask them what is particularly good that week, or what they can sell you for a set amount. 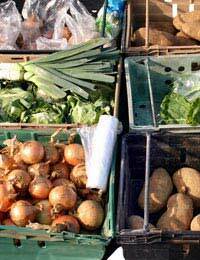 Many customers find that box schemes allow them to try a range of seasonal produce at a very reasonable price. The craziest part of buying fruit and vegetables flown in from overseas is that there is often a better, alternative product available from far closer to home. If you take time to look at the labels on your fruit and vegetables, you will find that Peruvian asparagus is right next to the British asparagus, when it is in season. Why not just make the most of the beautiful British asparagus, cooking wonderful meals that bring out the delicious flavour, rather than just decide to follow a recipe with asparagus when it is out of season. It won’t taste as good and you will be supporting the unnecessary practice of buying products all year round, rather than enjoying them in season.